The sun sets a few minutes after five o'clock now in Kyoto, so darkness descends early these days. It is a time of shadows. When I think of Japanese culture and shadows, it's hard not to think of Junichirō Tanizaki's essay In Praise of Shadows, which I first read as a college student decades ago. I purchased a copy here in Kyoto a few years ago, reread it, and highlighted passages I found interesting, especially those that I felt apply to my photography, geisha, and tayū. "Were it not for shadows, there would be no beauty. Our ancestors made of woman an object inseparable from darkness... They hid as much of her as they could in shadows, concealing her arms and legs in the folds of long sleeves and skirts, so that one part and one only stood out - her face" (page 33 in the Tuttle edition). First, Tanizaki's statement that there is no beauty without shadows goes completely against the conventional wisdom of modern beauty photography. In fact, beauty photography is almost synonymous with shadowless imagery. Second, I have never really found a completely convincing explanation as to why geiko and tayū paint their faces white. One story is that this custom goes back to Heian times, when the emperor was concealed behind a curtain and found it difficult to see visitors. As a result, his advisors painted their faces white. Another is that kabuki actors and later geiko and maiko adopted this custom from China's Peking opera. Tanizaki's assertion that only a woman's face was to stand out distinctly from the darkness gives just as plausible explanation as the others, if not more so. Besides a kimono or robes to conceal the body, what better way to make a face stand out against the shadows than to paint it white? 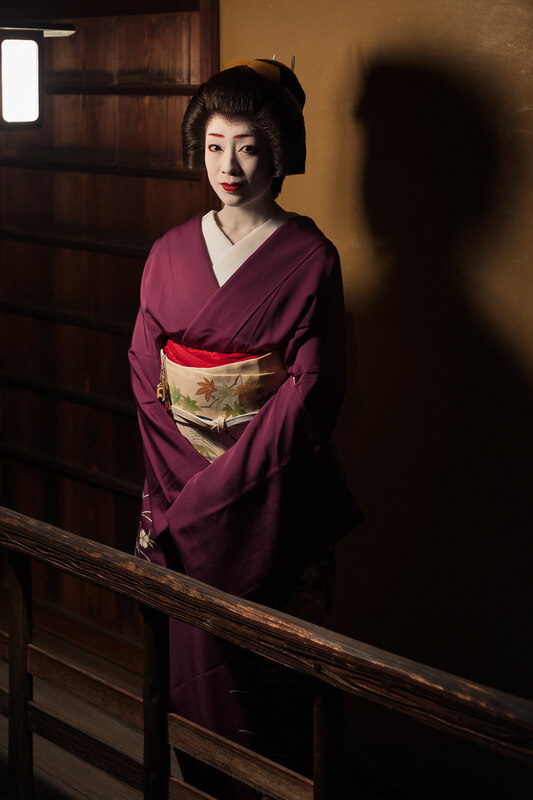 Would you notice Makiko's face as much in the photograph posted here if it were not painted white? Reading In Praise of Shadows again gave me a lot of food for thought. The role of shadows in photography, especially my photography of women, and the nature of beauty are just two of them. If you haven't read it, I recommend it! Finally, I love reading books on aesthetics, Japanese or otherwise, but most that I have found tend to be dreadfully boring and abstract, full of philosophical and academic mumbo-jumbo. Few are as concrete and practical as In Praise of Shadows. If anyone out there can recommend some good books, please comment and let me know!